This has come up so often in the last few days, probably due to the recent (Jan 2000) cold snap in the Northeastern US, that I decided to post this page on what I have learned about staying warm in your Land Cruiser over the past 18 Colorado winters. There are three steps, the first being obvious, the second two not so obvious. First, seal up those doors and windows. Most of us have Cruisers 20+ years old, and the weatherstrip around the doors and windows has aged and rotted quite a bit. You can buy new weatherstrip molded just like the factory original at Cool Cruisers of Texas, or if you are on a limited budget, getting creative with the door weatherstrip available from any hardware store can help. You can adjust the fit of your doors somewhat by loosening the screws/bolts, adjusting the position, then tighten back up. Heck, we all have to do that periodically just so the latches close right. The other two things have to do with getting the most heat out of your heaters, particularly the front one. 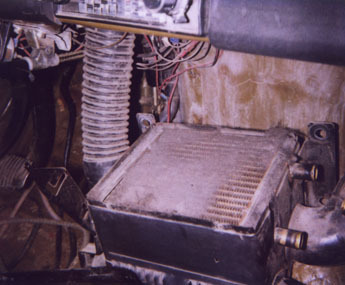 Many people don't realize that there is a second, round gasket which goes on top of the thermostat in cruisers. Leave that out and coolant will bypass and the coolant will never get up to proper operating temperature except on very hot days. Do NOT put cardboard in front of your radiator. That only reduces the efficiency of the radiator, and doesn't take care of the root problem, which is coolant bypassing the thermostat. The other important thing is to make sure the heater core is clean inside and out. Animal hairs, dust, dirt, pine needles and whatnot accumulate on the top of the core, reducing airflow through it. You need to clean it off every so many years. The other thing is that deposits form on the inside of the core more readily than other parts of the cooling system, so they need to be hot tanked in muriatic acid once in a while too. I am able to stay warm inside my cruisers in -25°F weather no problem when these 3 steps are taken.